This episode was based on the short story 'Dead Man's Mirror', first published in 1932. It was adapted for television by Anthony Horowitz and directed by Brian Farnham. This short story is one of Christie's longer endeavours, so it would have to be somewhat reworked to fit in a 50 minute time slot. Luckily, Horowitz more or less succeeds in maintaining the important plot points and character details. He does, however, make several significant changes. First, there is no letter from Chevenix to Poirot (he's called Chevenix here, not Chevenix-Gore). Instead, the two meet at an auction where they both bid on the same mirror. Second, Satterthwaite is removed and Hastings and Japp are added (in keeping with other episode in which characters like Satterthwaite, Goby and Arons are present). Hastings tags along on interviews and gets to discover certain points like "the first gong" some of the guest thought they heard. Third, Hugo Trent makes furniture here (very much in Poirot's style) and is upset because he can't get the financial backing from Chevenix. Lake (John Lake in the adaptation) has become an architect who has persuaded Chevenix to invest in a development project. This also allows for Poirot to be involved in the case at an earlier stage, because Chevenix invites him down to find out if he is a victim of fraud. Eventually, this leads Poirot onto a red herring at Northgate Development, the deserted building Lake has used for his fraud (leads to a somewhat dramatic rescue scene!). Fourth, several characters are removed, including Colonel Bury, Mr. Forbes, Godfrey Burrows and the doctor. Fifth, Ruth's background, with the unknown mother, is more obvious here. Sixth, Chevenix is something of an eccentric art historian, and not a 'Sir', but his interest in family and family history is still present. Miss Lingard works for him as a research assistant - they are preparing a book for the Museum of Modern Art (an important addition, because a painting leads Poirot onto the murderer). Finally, the murderer used a champagne bottle rather than a paper bag to create the illusion of a shot - and she even tries to convince Vanda that she killed her husband by appealing to her superstitious nature. All in all, though, the adaptation is largely faithful and the end result is a dark episode of the series. The most memorable guest actor here is Iain Cuthbertson (Gervase Chevenix), but Jeremy Northam (Hugo Trent) and Richard Lintern (John Lake) should be familiar to many. The latter would make another appearance in Mrs. McGinty's Dead. The change to Chevenix (an eccentric art historian but not "titled") was problematic for me. The defining negative trait of Sir Gervase Chevenix-Gore in the books was his classism, snobbery, and personal pride in his aristocratic status. It was for this reason that he so badly wanted his adopted daughter and nephew to marry each other - to continue the family he was so proud of. This version of Chevenix is still into all that stuff - but coming from an eccentric art collector, it doesn't make as much sense, nor seem as formidable. I realize most people in this society are "classist" to some degree, but if anyone would NOT be, it would be those working in the arts. And while this Chevenix is definitely arrogant and presumptuous in ordering people around, he doesn't seem like he tries to behave "upper class" any way except trying to dictate who his daughter and nephew marry. for the record, being aristocratic and being "titled" are two different things. if your read english literature (such as austen for 1 instance) you will notice that some of the most ancient families do not necessarily have titles, while titles were handed out quite liberally. we seem to require that fiction like this present popular clichés instead of individuals; in this case, a man who is titled and behaves as other such "upper class" people behave, in other movies. Good point, fangirl82. Making Chevenix an art collector works, but that could have been his interest and he could still have been an aristocrat. I'm pretty sure his surname should be pronounced "Chevenee" and not the phonetic way everyone pronounces it here. (It's a variant of the name Chenevix, which is definitely pronounced that way.) Poirot at least should know better as the pronunciation is French. The TV/film trope of breaking open doors is difficult enough to swallow at the best of times, but there's no way anyone could successfully shoulder charge that heavy oak door set in six inch thick stone wall. There is another major change in the script: he found dead with a pistol in his left hand but in the book it is his right hand. It was because of a mistake Agatha Christie made by describing the table stood along the left wall when they broke in. It was impossible to shoot him through the right temple and the bullet passed through the door which apparently was in opposite direction. Ah, that's right! Thanks for pointing that out. My partner and I are currently working our way thorough the whole set and we both had a question about this one. 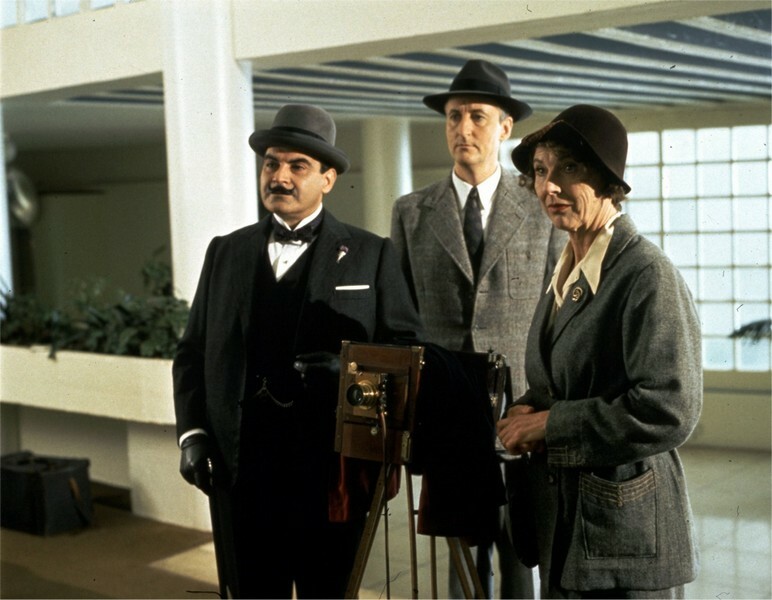 How come Poirot was so reluctant to get involved in the rescue? When the explosion happens he seems more interested in saving himself, and actually seems scared. He stands by and lets Hastings and Japp do the gallant thing and rescue the lady in the fire. I'd think as a former member of the Police he would be used to a few scrapes and a bit of danger. Plus, as he is so usually dashing and respectful to others (especially females) I would have thought he'd be leaping through the flames in order to rescue them. Perhaps I'm just overthinking it - it might have just been for dramatic purposes. But is there something in his character that would suggest otherwise?